One of the pleasures of living here in the mountains is enjoying the fruits of our labors (ha, ha)…well, it does take quite a bit of laboring to end up with enough fruit or berries to make a cobbler as the deer, squirrels and wild turkeys feel that this is their home too, and as long as they leave us alone in the daytime what they find to pick and munch on at night or when we are away from our post is fair game. 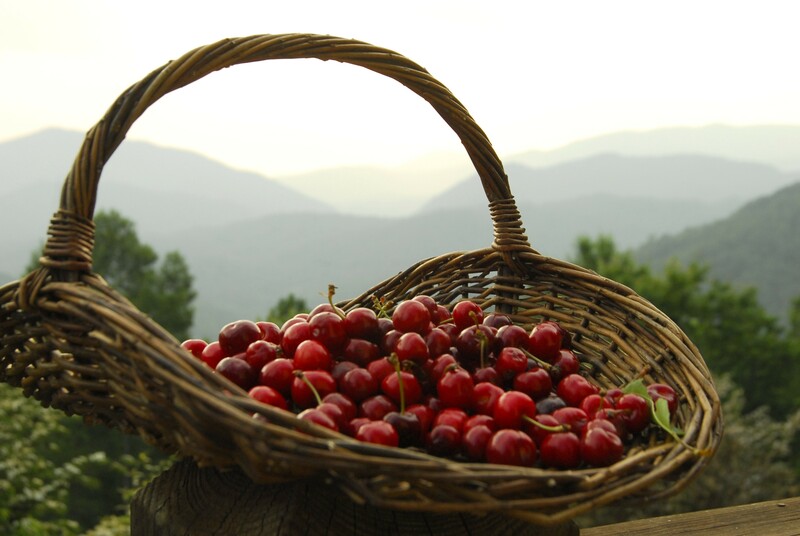 All to say that this week we picked and pitted the four cups of cherries necessary for our cobbler and have been munching on it for a couple of days now, à la all the critters we compete with for our goodies. This “basic” recipe works well with all the fruit we have tried – blackberries, blueberries, raspberries, peaches, and plums as well as cherries. Use peaches, blackberry, blueberry, raspberry, or a combination of these. If using peaches, slice them. If using berries, wash or pick over them discarding any stems or yucky berry. Allow berries to drain as much rinse water as possible. If using cherries, pit them before using. You will lose about 1/5 of the volume, so you need to start with more than 4 cups of cherries. Dot a cast iron skillet with 2 tablespoons of unsalted butter and set in the preheated oven. Put the fruit in a bowl and sprinkle it with the 2 tablespoons of flour and the 1/2 cup of sugar. Remove the skillet from the oven when the butter has melted. Add the fruit mixture to the skillet. Set aside. Put the next 5 ingredients in the order given into a food processor bowl. Pulse until it resembles coarse ground corn meal. Add milk, egg, and vanilla. Pulse to blend. Pour the batter onto the fruit in the cast iron skillet. Bake for 25 minutes or until knife inserted into cake comes out clean.